If you love your pets like we do Then I would assume when you get a new pet they become a new addition to your family I know at our house they sure do. As a mother I try to shop for what will make my kids happy and of course keep them healthy I guess you could say I treat my pets the same way. 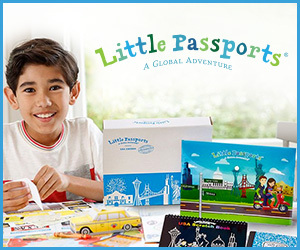 When i'm shopping for them I try to make the same decisions as I would for my kids. 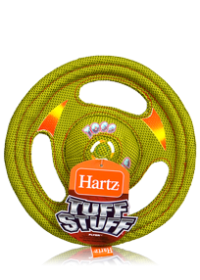 With the product line Hartz offers lets just say it makes my job a whole lot easier when it comes to my pets. We recently received Hartz toy line for our dog diamond. 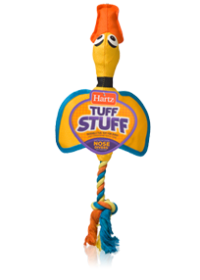 These toys were great she got to try the Hartz Dura Play Tug of Fun Dumbbell, Hartz Tuff Stuff Flyer, Hartz Tuff Stuff Nose Diver Large and Hartz Nature’s Collection Quacker Plush Large. 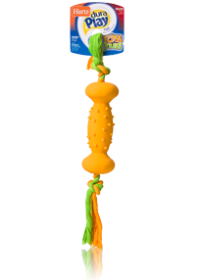 Diamonds favorite seemed to be the Dura play Tug of Fun Dumbbell she got hours of fun out of this toy and it really held up the rope that runs through this toy makes it extra durable for extended hours of toss and retrieve play! and plus I think she really enjoyed that this toy is bacon-scented! All in all she was tickled with all of her Hartz toys will just say she was a very happy dog. We were also wanting something to help keep diamonds teeth healthy. 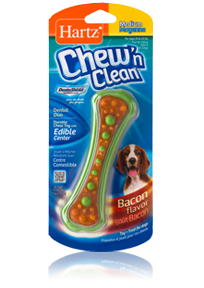 Hartz also had a great solutions for this as well they sent her the Hartz Chew ‘n Clean Dental Duo Small / Medium this was great exactly what she needed a chew toy and treat all in one. 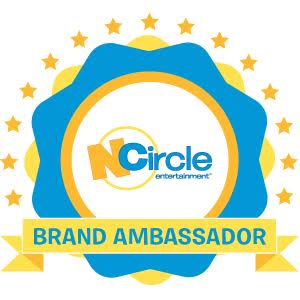 This long-lasting chew has a durable nylon shell combined with a tasty bacon flavored treat. 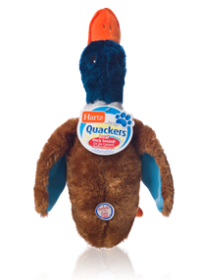 Not only does this toy satisfy the natural desire to chew, it also gently massages your dog’s gums while helping to minimize plaque and tartar. So With this package we received from Hartz I hit everything I was looking for, not only did I make Diamond Happy I also Made sure to get her something that would assure her health as well thanks to the Hartz company.